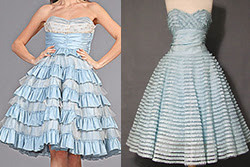 Designers often "borrow" from the past, but this Quinceanera Prom Dress ($400) from Betsey Johnson is very similar to the 50s era vintage confection on the right ($215). Tu es d'accord, n'est-ce pas? A Quinceanera is basically a Latina debutante ball for 15 year olds. Where's my tiara?